We got a big roll of Russian Salami from a friend..decided to use it to cook .. This is super easy..! and tasty too. 1. using a potato peeler, scrap/peel off the outer skin of the asparagus. 2. Cut into 4 sections(per stalk). 3. Blanch in boiling hot water for 2 to 3 mins till cooked. 4. Drain and wash in cold water. 5. Heat up the frying pan to add olive oil. Add salami to sear till slightly crispy. Add sugar to toss and then turn off the heat. 6. 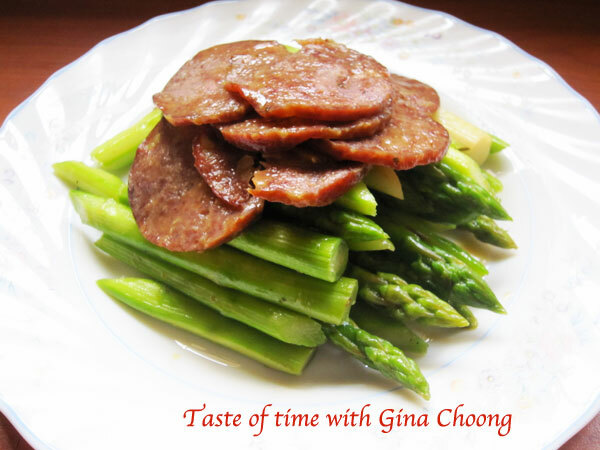 Arrange asparagus on a plate and top it off with the salami. Serve immediately.